Pancreatic islets are innervated by autonomic and sensory nerves that influence their function. Analyzing the innervation process should provide insight into the nerve-endocrine interactions and their roles in development and disease. Here, using in vivo time-lapse imaging and genetic analyses in zebrafish, we determined the events leading to islet innervation. Comparable neural density in the absence of vasculature indicates that it is dispensable for early pancreatic innervation. Neural crest cells are in close contact with endocrine cells early in development. We find these cells give rise to neurons that extend axons toward the islet as they surprisingly migrate away. Specific ablation of these neurons partly prevents other neurons from migrating away from the islet resulting in diminished innervation. Thus, our studies establish the zebrafish as a model to interrogate mechanisms of organ innervation, and reveal a novel mode of innervation whereby neurons establish connections with their targets before migrating away. Pancreatic islets are innervated by sympathetic, parasympathetic and sensory nerves (Taborsky et al., 1998; Havel and Ahren, 1997; Ahrén, 2000; Gilliam et al., 2007). Studies have highlighted the role of autonomic innervation on pancreas development and endocrine hormone secretion (Ahrén, 2000; Borden et al., 2013). Whether innervation directly modulates glucose homeostasis and contributes to diabetes progression remains controversial, despite effects of sympathetic and parasympathetic nerves on pancreatic islet hormone secretion (Ahrén, 2000; Gautam et al., 2006) and the role of sensory fibers on autoimmunity (Tsui et al., 2007). The debate stems in part from a lack of detailed understanding of several processes including the innervation process during development, the maintenance of innervation in adult stages, and the communication between nerves and islet cells. Although differences in autonomic innervation pattern in the endocrine pancreas have been observed between rodents and humans (Rodriguez-Diaz et al., 2011, 2012), the influence of the autonomic nervous system on pancreatic hormone secretion is conserved across species (Havel and Ahren, 1997; Ahrén, 2000; Gilliam et al., 2007; Borden et al., 2013; Gautam et al., 2006). More recently, this difference in pattern has been challenged by immunostaining of thick tissue sections and whole mounts (Hsueh et al., 2017; Tang et al., 2018, 2014). Given the age-related disparity between rodent and human samples in studies comparing innervation architecture, the dynamic regulation of pancreatic innervation in response to age and environmental influences could be contributing to the observed species differences. Indeed, higher innervation density is observed in human fetal pancreas in comparison to adult (Proshchina et al., 2014), and loss of innervation is observed in humans with Type one diabetes (Mundinger et al., 2016), as it is in several rodent models of autoimmune diabetes (Mundinger and Taborsky, 2016). Studying the dynamic regulation and maintenance of pancreatic innervation could provide a better understanding of diabetes etiology and progression. Whether innervation is a result of vasculature- (Reinert et al., 2014; Cabrera-Vásquez et al., 2009) or neural crest- (Plank et al., 2011; Nekrep et al., 2008; Muñoz-Bravo et al., 2013; Kozlova and Jansson, 2009; Jiang et al., 2003; Young and Newgreen, 2001; Arntfield and van der Kooy, 2013) derived guidance cues remains controversial. And although lineage tracing and knockout studies have suggested a neural crest origin for pancreatic nerves (Plank et al., 2011), interpretations can be limited by the Cre driver line specificity (Chen et al., 2017; Lewis et al., 2013). Additionally, it remains difficult to differentiate between the local effects of autonomic fibers on islet cell physiology from the simultaneous influence on other organs that can indirectly modulate hormone secretion (Taborsky, 2011). The zebrafish, with organs homologous to mammalian ones and conserved signaling and metabolic pathways (Schlegel and Stainier, 2007; Seth et al., 2013; Ober et al., 2003), is ideal to study the role of neuronal innervation during endocrine pancreas development. 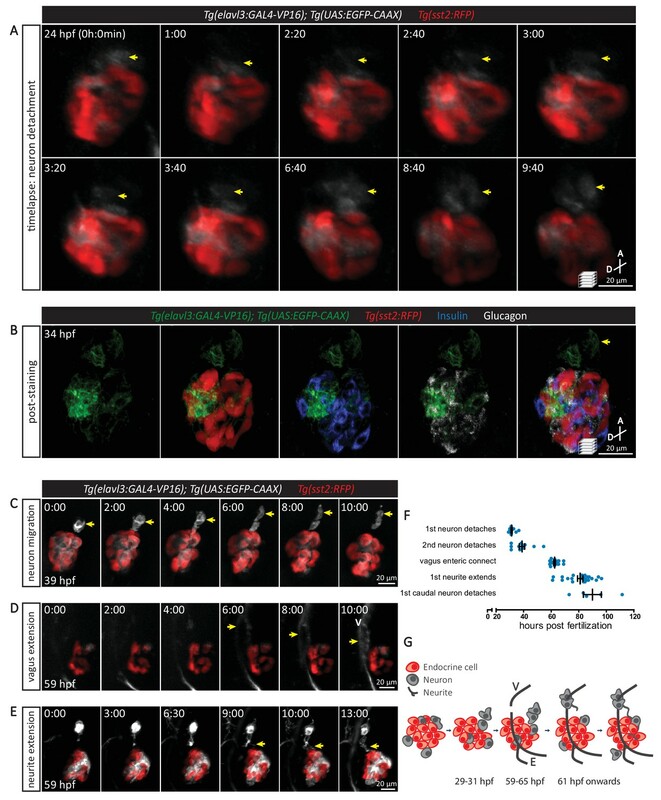 The transparency and rapid embryogenesis of zebrafish, together with fluorescent reporters, allow for the study of developmental processes with single-cell resolution using in vivo time-lapse imaging (Beis and Stainier, 2006). Insights into the innervation process could provide clues on the mechanisms utilized by autonomic innervation to regulate islet cell function, growth and survival. Unlike most other vertebrate models, the zebrafish develops externally, and its transparency during embryonic and early larval stages makes it highly attractive to study tissue organogenesis using in vivo time-lapse imaging. To understand pancreatic innervation in zebrafish, we first determined an approximate timeframe of innervation by conducting whole mount immunostaining starting at 50 hr post fertilization (hpf). We found that the onset of pancreatic innervation arises early in development (Figure 1A–D), preceding the fusion of the dorsal and ventral pancreatic buds (Field et al., 2003), and that prior to 120 hpf, the majority of this innervation is derived from the vagus nerve (Figure 1A). Looking more closely, we first observed the migration of the vagus nerve near the pancreatic islet at 50 hpf (Figure 1B), parasympathetic extensions from the vagus nerve towards the pancreatic islet by 75 hpf (Figure 1C), and an extensive network of nerve fibers within the islet by 100 hpf (Figure 1D). Both juvenile (25 days post fertilization; dpf) and adult (1 year old) zebrafish display dense innervation networks within the endocrine pancreas (Figure 1E–F). By 25 dpf, the celiac ganglion provides sympathetic innervation (Figure 1E), as previously described (Podlasz et al., 2016), and at this stage intra-pancreatic innervation between the primary and secondary islets is also present (Figure 1E). Pancreatic islet innervation in zebrafish is established early in development and maintained in juvenile and adult stages. (A-D) Whole mount immunostaining of wild-type zebrafish at 50, 75, 100, 120 hr post fertilization (hpf) for acetylated Tubulin (nerves), Insulin (beta cells), Somatostatin (delta cells), and DAPI (DNA). (E–F) Whole mount immunostaining of 25 days post fertilization (dpf) zebrafish and 1 year zebrafish pancreas and intestine following tissue clearing with the CLARITY protocol. Maximum intensity projections are presented; A, anterior; D, dorsal; V, vagus nerve; ND, nodose ganglion; P, pancreas; S, sympathetic innervation; Pi, intra-pancreatic innervation. The upregulation of elavl3 expression is a hallmark of post-mitotic neuron differentiation (Dyer et al., 2014), and the elavl3 promoter activity can be used as a pan-neuronal reporter (Stevenson et al., 2012). The triple transgenic line Tg(elavl3:GAL4-VP16); Tg(UAS:EGFP-CAAX); Tg(sst2:RFP) enables in vivo visualization of the innervation process in conjunction with endocrine pancreas development, where delta cells are expressing the RFP reporter. Single cell resolution imaging allowed us to define the key cellular events leading to the establishment of parasympathetic innervation (Figure 2A–F). Post-mitotic neurons, with elavl3 promoter activity, were closely associated with the endocrine islet very early in development (Figure 2A). Starting around this time, neurons began to migrate toward the periphery of the endocrine cluster, and from 28 hpf a subset of neurons detached from its anterior portion (Figure 2A, Figure 2—videos 1–2). Whole mount immunostaining showed that the cells detaching from the endocrine cluster were not alpha, beta, or delta cells (Figure 2B). This neuronal detachment was a sequential process, whereby the first observed detachment event occurred at 28–31 hpf and additional neurons detached from 31 to 50 hpf (Figure 2A,C). Subsequently, these neurons migrated rostrally, away from the endocrine cluster (Figure 2C, Figure 2—video 3). Next, the vagus nerve extending from the nodose ganglion migrated caudally past the endocrine islet, and the vagus reporter signal overlapped with enteric nerves at 59–65 hpf (Figure 2D, Figure 2—video 4). 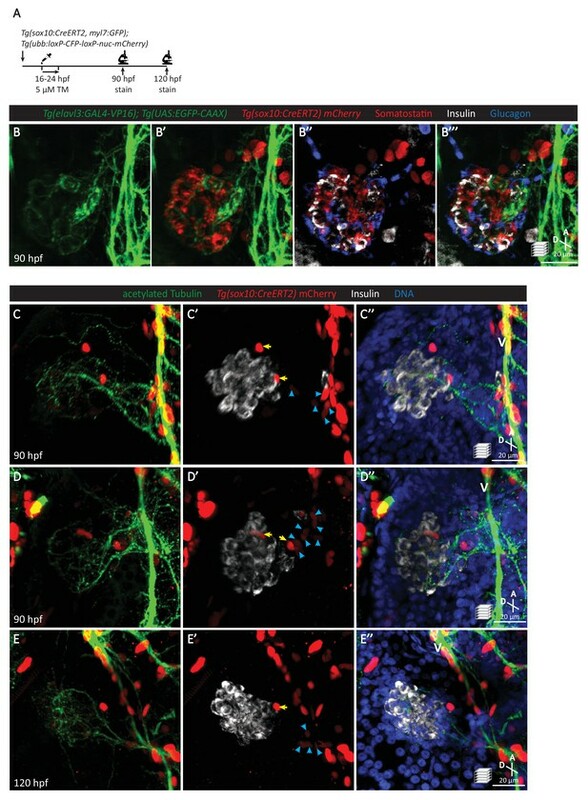 As the detached neurons continued to migrate away from the endocrine cells, we could observe neurites extending toward the endocrine cluster (Figure 2E, Figure 2—video 5). This process was followed by interaction of the detached neurons with the vagus nerve (Figure 2—video 6). 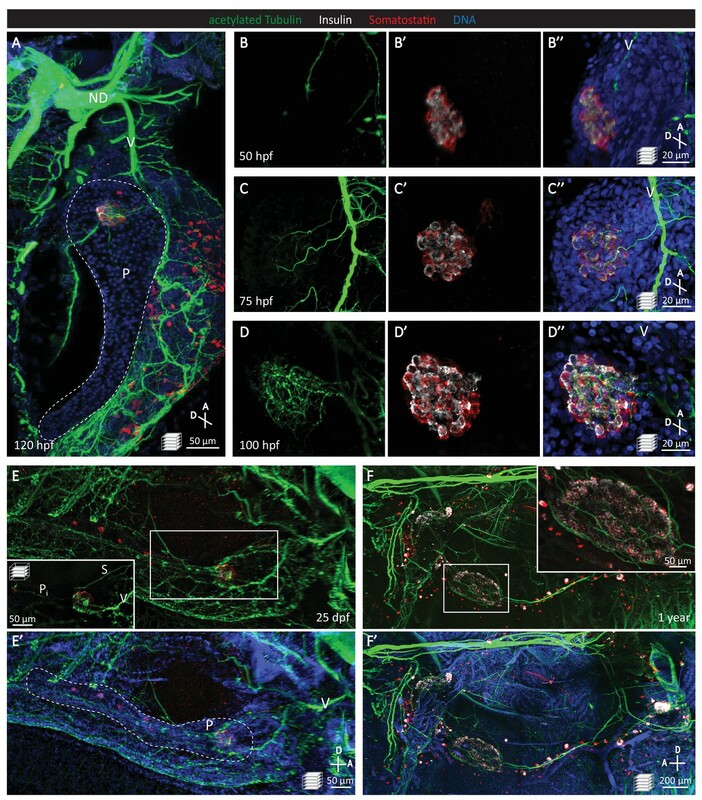 At 80 hpf, immunostaining revealed the extension of neurites derived from elavl3-positive cells toward the islet (Figure 2—figure supplement 1). Interestingly, neurons also detached from the posterior end of the endocrine cluster and migrated caudally toward the developing secondary islets (Figure 2—video 7), while the other neurons stayed on the periphery of the primary islet. These latter two neuronal populations could respectively be important for the formation of intra-pancreatic innervation (Figure 1E) and contribute to the peri-endocrine nerve plexus that has been reported in rodents (Ushiki and Watanabe, 1997). Due to the high degree of variation in vagus innervation, which was also observed for enteric innervation (Olsson et al., 2008), and the slight developmental delay that occurs during the time-lapse imaging of anesthetized zebrafish, we observed variability in the exact developmental timing of individual cellular events in different embryos (Figure 2F). Nonetheless, the order of the cellular events was always the same and in combination with the immunostaining data, it allows us to propose a model for the initial establishment of parasympathetic innervation (Figure 2G). The sequence of cellular events preceding pancreatic islet parasympathetic innervation is revealed with single-cell resolution time-lapse confocal imaging. (A) Tg(elavl3:Gal4-VP16); Tg(UAS:EGFP-CAAX); Tg(sst2:RFP) zebrafish mounted in 0.5% agarose containing 0.017% tricaine were imaged with laser scanning confocal microscopy at 20 min time intervals. Maximum intensity projections of selected timeframes are presented (A, anterior; D, dorsal). Yellow arrows point to the detachment of neurons from the pancreatic islet. (B) Whole mount immunostaining at 34 hpf for GFP (neurons), RFP (delta cells), Insulin (beta cells), and Glucagon (alpha cells) after 10 hr time-lapse imaging. The detached neurons are not positive for endocrine cell markers. (C-E) Confocal imaging of Tg(elavl3:Gal4-VP16); Tg(UAS:EGFP-CAAX); Tg(sst2:RFP) zebrafish at 20–30 min time intervals. Maximum intensity projections of selected timeframes are presented. Yellow arrows point to the cellular events of interest. (F) Quantification of the time when the indicated cellular events were observed for individual fish (mean ± SEM). (G) Schematic of the sequence of cellular events preceding parasympathetic innervation of the pancreatic islet. V, vagus nerve; E, enteric nerve. A neural crest origin for pancreatic nerves has been suggested from lineage tracing and knockout studies in mouse (Plank et al., 2011). Using lineage tracing with Tg(sox10:CreERT2, myl7:GFP); Tg(ubb:loxP-CFP-loxP-nuc-mCherry) zebrafish upon tamoxifen treatment from 16 to 24 hpf (when the neural crest population reaches its peak) (Mongera et al., 2013), we found a population of neural-crest-derived cells expressing the elavl3 promoter in association with the endocrine islet at 35 hpf (Figure 3A,B). 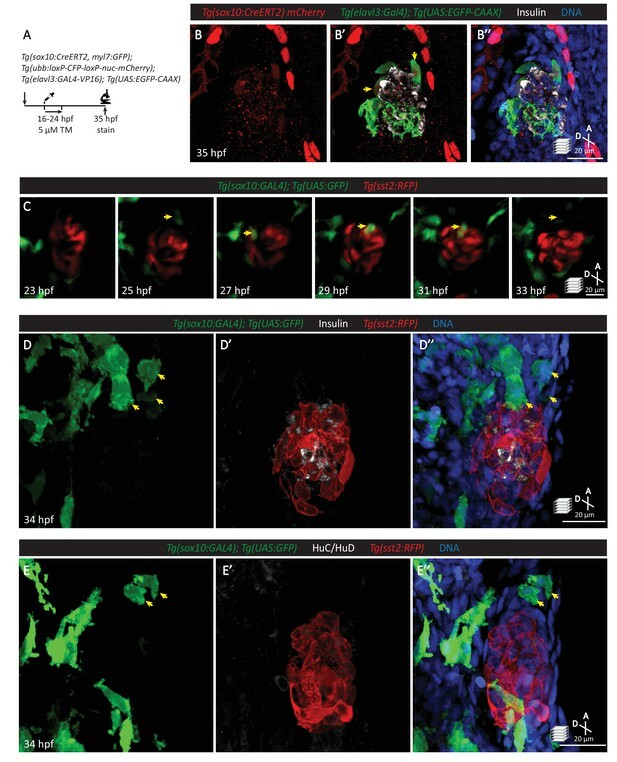 Live imaging of Tg(sox10:GAL4); Tg(UAS:GFP); Tg(sst2:RFP) zebrafish revealed the migration of neural-crest-derived cells toward the islet before 27 hpf, their contact with the islet, and subsequently their migrating away from the islet (Figure 3C). Immunostaining showed that the cells migrating away from the islet were not beta or delta cells (Figure 3D). Although elavl3 promoter activity was observed in a subpopulation of endocrine cells (Figure 2B), our data suggest that they do not contribute to the subset of cells migrating away from the islet. Interestingly, we also did not observe immunostaining for HuC/HuD in this subpopulation of neural-crest-derived cells (Figure 3E), suggesting that these cells are not yet fully mature neurons. Neural crest cells are in close contact with pancreatic endocrine cells early in development. (A) Lineage tracing of neural crest cells in Tg(sox10:CreERT2, myl7:GFP); Tg(ubb:loxP-CFP-loxP-nuc-mCherry); Tg(elavl3:GAL4-VP16); Tg(UAS:EGFP-CAAX) zebrafish following 5 µM tamoxifen treatment from 16 to 24 hpf and staining at 35 hpf. (B) Whole mount immunostaining at 35 hpf for mCherry (neural-crest-derived cells), GFP (elavl3-positive cells), Insulin (beta cells), and DAPI (DNA). (C) Confocal imaging of Tg(sox10:GAL4); Tg(UAS:GFP); Tg(sst2:RFP) zebrafish mounted in 0.5% agarose from 23 to 33 hpf. Yellow arrow points to a neural crest cell in close proximity to endocrine pancreatic cells and briefly contacting islet cells before migrating away. (D) Whole mount immunostaining at 34 hpf for GFP (sox10-positive cells), Insulin (beta cells), RFP (delta cells), and DAPI (DNA). Yellow arrows point to neural-crest-derived cells that were once in contact with the pancreatic islet. (E) Whole mount immunostaining at 34 hpf for GFP (sox10-positive cells), HuC/HuD (mature neurons), RFP (delta cells), and DAPI (DNA). Yellow arrows point to neural-crest-derived cells that were once in contact with the pancreatic islet. To further test whether the pancreatic nerve density was indeed neural crest derived, we lineage-traced neural crest cells with Tg(sox10:CreERT2, myl7:GFP); Tg(ubb:loxP-CFP-loxP-nuc-mCherry) zebrafish upon tamoxifen treatment from 16 to 24 hpf (Figure 4A–E). The neural-crest-derived cells were not positive for Insulin, Glucagon, or Somatostatin staining at 90 hpf (Figure 4B). We found that nerve extensions toward the primary islet at 90 and 120 hpf were indeed derived from cells that were once positive for sox10 promoter activity (Figure 4C–E). We also observed sox10-derived cells that remained on the periphery of the primary islet (Figure 4C–E). The decrease in the number of sox10-derived cells in between the vagus nerve and pancreatic islet when comparing 90 to 120 hpf suggests that these cells are migrating toward the vagus nerve (Figure 4C–E). Additionally, immunostaining of sox10 mutants, which exhibit a severe depletion in neural crest cells (Dutton et al., 2001), revealed a complete absence of pancreatic innervation even though the vagus nerve extension was present (Figure 4—figure supplement 1). Overall, these data agree with the neural crest origin of pancreatic innervation that has been reported in rodents (Plank et al., 2011; Nekrep et al., 2008; Muñoz-Bravo et al., 2013; Kozlova and Jansson, 2009; Jiang et al., 2003; Young and Newgreen, 2001). Pancreatic islet parasympathetic innervation is derived from the neural crest. (A) Lineage tracing of neural crest cells in Tg(sox10:CreERT2, myl7:GFP); Tg(ubb:loxP-CFP-loxP-nuc-mCherry) zebrafish following 5 µM tamoxifen treatment from 16 to 24 hpf and staining at 90 and 120 hpf. (B) Whole mount immunostaining at 90 hpf for GFP (elavl3-positive cells), mCherry (neural-crest-derived cells), Somatostatin (delta cells), Insulin (beta cells), and Glucagon (alpha cells). (C–E) Whole mount immunostaining at 90 (C, D) and 120 (E) hpf for acetylated Tubulin (nerves), Insulin (beta cells), mCherry (neural-crest-derived cells), and DAPI (DNA). Yellow arrows point to neural-crest-derived cells on the periphery of the pancreatic islet; blue arrowheads point to neural-crest-derived cells projecting neural extensions toward the pancreatic islet, and some of these cells are adjacent to the vagus nerve (V). Several mechanisms of pancreatic innervation have been proposed, including axons following along blood vessels to eventually innervate the endocrine pancreas (Reinert et al., 2014; Cabrera-Vásquez et al., 2009), and neural crest cells found closely associated with endocrine cells eventually differentiating into neural and glial cells (Plank et al., 2011; Nekrep et al., 2008). We carefully examined the cellular events preceding the onset of endocrine pancreas innervation using the zebrafish model. By utilizing cloche mutants, which lack most endothelial cells (Stainier et al., 1995; Liao et al., 1997; Reischauer et al., 2016) including those endothelial cells that give rise to the pancreatic vasculature (Field et al., 2003), we wanted to examine whether blood vessels were crucial for islet innervation (Figure 5A). Even though cloche mutants display fairly severe defects (Figure 5B–D) and the vasculature was completely absent throughout the gastrointestinal system, as visualized by Tg(kdrl:GFP) expression, by 80 hpf both the right and left vagus nerve extensions could be observed in wild-type and mutant fish (Figure 5E–F). Interestingly, extensive innervation of the pancreatic islet, comparable to that in wild-type, was also observed in cloche mutants (Figure 5G–I). 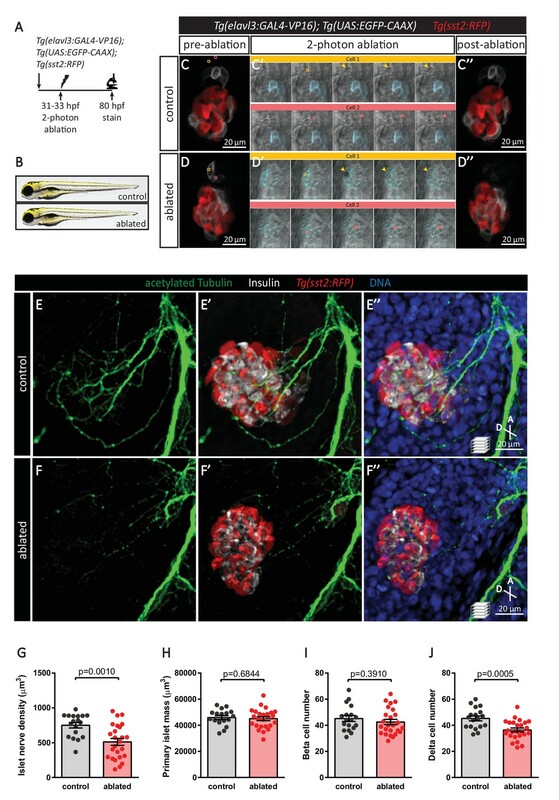 A dense network of nerves could still be observed in the pancreatic islet at 4 dpf (Figure 5—figure supplement 1), suggesting that this initial stage of islet innervation and its expansion does not require signaling from endothelial cells. Thus, although it is likely that maintenance of nerve density requires vascular supply (Reinert et al., 2014), our studies indicate that the presence of a vascular network is not crucial for the establishment of innervation. The vasculature is not essential for the initial establishment of pancreatic islet parasympathetic innervation. (A) Immunostaining analysis of innervation density in Tg(kdrl:GFP) wild-type and cloche mutants at 80 hpf. (B) Wild-type and cloche-/- larvae were imaged at 80 hpf. (C) Body length measurements at 80 hpf, mean ± SEM, n = 21–27 animals. (D) Whole larva free glucose level measurements at 80 hpf, mean ± SEM, n = 12 batches of five larvae per replicate. (E–I) Whole mount immunostaining at 80 hpf for GFP (blood vessels), acetylated Tubulin (nerves), Somatostatin (delta cells), and DAPI (DNA). Maximum intensity projections are presented; A, anterior; D, dorsal. Quantification of islet nerve density (G), mean ± SEM, n = 9–10 animals, p-values from t tests are presented. No significant difference in vagus nerve extension and islet innervation was observed between wild-type and cloche-/- larvae. VR, right vagus nerve; VL, left vagus nerve; P, pancreas; I, intestine. Our in vivo time-lapse imaging revealed the detachment of neurons from the endocrine islet and their migration toward the vagus nerve. To determine whether this subpopulation of detached neurons plays a crucial role in the innervation density observed at 75 hpf (Figure 1C), we conducted targeted cell ablation studies (Figure 6A). We utilized a two-photon laser to specifically ablate at 31–33 hpf neurons that have detached from the developing islet (Figure 6C mock ablation as control; Figure 6D two-photon ablation) and conducted immunostaining at 80 hpf, when extensive parasympathetic innervation is already observed in controls (Figure 6E). In comparison to the mock ablated controls, where cells immediately adjacent to the leading front of the detached neurons were targeted with the same laser intensity (Figure 6C), there was a significant reduction in innervation density upon ablation of the detached cluster of neurons (Figure 6F–G), while extension of the vagus nerve and enteric innervation appeared unaffected (Figure 6F). The absence of differences in size and gross morphology of the fish suggests that this decline in innervation density was not due to developmental delay (Figure 6B). Given that targeted ablation did not disrupt development of the enteric nervous system, we next wanted to determine whether endocrine cell development was perturbed upon disruption of islet nerve density. Immunostaining at 80 hpf for Insulin and Somatostatin revealed no significant differences in islet mass or beta cell numbers between the ablated fish and mock ablated controls; however, a significant decrease in delta cell numbers was observed (Figure 6H–J), suggesting that early innervation is involved in establishing or maintaining the delta cell pool. Targeted ablation studies reveal the crucial role of peri-islet neurons for the initiation of pancreatic islet parasympathetic innervation. (A) Schematic of the two-photon ablation experiment. (B) Gross morphology at 80 hpf was comparable between control and ablated fish. (C–D) Tg(elavl3:Gal4-VP16); Tg(UAS:EGFP-CAAX); Tg(sst2:RFP) zebrafish mounted in 0.5% agarose with tricaine were subjected to two-photon laser ablation. The detached neuron clusters were ablated between 31 and 33 hpf. The control was mock ablation of cells adjacent to the leading edge of the migrating neurons using the same laser intensity. Pre-ablation, short time-lapse immediately following ablation, and post-ablation images are displayed. Orange and pink boxes outline the regions of ablation; arrowheads point to ablated cells. (E–J) Whole mount immunostaining at 80 hpf for acetylated Tubulin (nerves), Insulin (beta cells), RFP (delta cells), and DAPI (DNA). Quantification of islet nerve density (G), primary islet mass (H), beta cell number (I), and delta cell number (J), mean ± SEM, n = 18–25 animals, p-values from t tests are presented. In order to determine whether synaptic transmission was required for parasympathetic innervation, we overexpressed botulinum toxin light chain B in post-mitotic neurons using Tg(elavl3:GAL4-VP16); Tg(UAS:BoTxBLC-GFP) fish (Figure 7A). Inhibition of neural activity did not result in developmental delay at 80 hpf (Figure 7B–C); however, a significant decrease in islet nerve density was observed even though the vagus nerve developed normally (Figure 7E–I). Similar to the targeted cell ablation approach, analysis of immunostained fish revealed no differences in beta cell numbers but a significant decrease in delta cell numbers (Figure 7K–L). Interestingly, delta cell hypertrophy was observed (Figure 7—figure supplement 1), which could account for the significant increase in primary islet mass (Figure 7J). Elevated free glucose levels were also observed upon inhibition of neural transmission at 80 hpf (Figure 7D), and they remained elevated at 5 dpf, similar to what we observed in sox10 mutants which lack neural crest cells (Figure 7—figure supplement 2). Whether the increase we observed in whole larva free glucose levels is directly related to pancreatic islet development or perturbed functional modulation by parasympathetic innervation on the islet or other peripheral organs remains to be examined. To further analyze the changes in endocrine cell mass, we used a genetic ablation method (Curado et al., 2007; Pisharath and Parsons, 2009) whereby Nitroreductase (NTR) was specifically expressed in post-mitotic neurons in Tg(elavl3:GAL4-VP16); Tg(UAS:NTR-mCherry) fish (Figure 7—figure supplement 3). Upon treatment with metronidazole (MTZ, a pro-drug that is converted to a cytotoxic form in the presence of NTR) from 24 to 80 hpf to induce global neuronal ablation, we detected significant decreases in beta and delta cell numbers (Figure 7—figure supplement 3C–D). Overall, our data suggest that the early establishment of parasympathetic innervation requires the presence of neurons that are initially associated with the endocrine pancreas as well as active neural transmission. Notably, significant changes in pancreatic delta cell mass were observed upon decreased islet nerve density. Inhibition of neural synaptic transmission diminishes islet parasympathetic innervation. 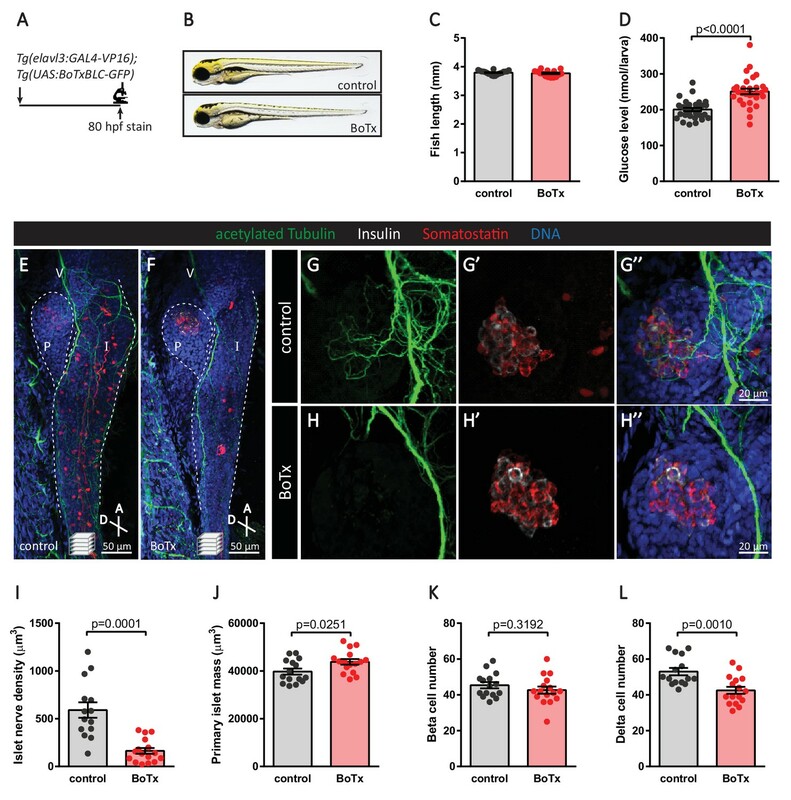 (A) Botulinum toxin (BoTx) was expressed in post-mitotic neurons to inhibit neurotransmitter release in Tg(elavl3:Gal4-VP16); Tg(UAS:BoTxBLC-GFP) zebrafish. (B) Control and BoTx-positive fish were imaged at 80 hpf. (C) Body length measurements at 80 hpf, mean ± SEM, n = 17–20 animals. (D) Whole larva free glucose level measurements at 80 hpf, mean ± SEM, n = 30 batches of five larvae per replicate. (E–L) Whole mount immunostaining at 80 hpf for acetylated Tubulin (nerves), Insulin (beta cells), Somatostatin (delta cells), and DAPI (DNA). Maximum intensity projections are presented; A, anterior; D, dorsal; V, vagus nerve; P, pancreas; I, intestine. Quantification of islet nerve density (I), primary islet mass (J), beta cell number (K), and delta cell number (L), mean ± SEM, n = 14–16 animals, p-values from t tests are presented. Autonomic innervation can regulate the function of the endocrine pancreas (Ahrén, 2000). The brain centers linked to pancreatic innervation have been mapped with retrograde neuronal tracing (Rosario et al., 2016; Kreier et al., 2006). More recently, studies have demonstrated that modulation of nerve activity in the brain can influence pancreas function (Kume et al., 2016; Croizier et al., 2016). However, our knowledge of the local effects of nerves is limited due to the effects of nerve transmission on other target organs. Through our studies of neuronal development in zebrafish, we identified a subpopulation of neurons that are involved in pancreas-specific parasympathetic innervation, and ablation of these neurons significantly diminished local nerve density. Further lineage-tracing studies would be useful to distinguish nerves coming from the detached neurons to those entirely from the vagus. Nonetheless, this targeted ablation method provided us with a model whereby nerve density remains unaltered in other tissues and allowed us to interrogate the local effects of nerves on endocrine pancreas development. Interestingly, a specific effect on delta cell mass was observed upon diminished nerve density. Likewise, global neural inhibition and global neuron ablation also led to a decline in delta cell mass. However, in the case of global neuron ablation, we also observed a decline in beta cell mass likely due to secondary effects from the extensive levels of neuronal cell death. Given the potential role of Somatostatin signaling in mediating migration of developing neurons (Yacubova and Komuro, 2002), it is possible that delta cell loss could worsen the decline in innervation density. Similar to what has been reported in rodents (Hsueh et al., 2017; Tang et al., 2018), a dense supply of nerve fibers could be observed within the endocrine pancreas of developing and adult zebrafish. Parasympathetic innervation predominates prior to 5 dpf, but by 25 dpf, sympathetic innervation extending from the celiac ganglia was also detected. Galaninergic nerves have been previously identified in the zebrafish pancreas (Podlasz et al., 2016), and as in non-human primates these nerves are parasympathetic (Verchere et al., 1996). The neurons present on the periphery of the islet as revealed in our studies could give rise to the peri-endocrine nerve plexus which has been observed in rodents (Tang et al., 2014; Ushiki and Watanabe, 1997). Targeted ablation of these neurons at later stages should help decipher their role. To our knowledge, ours is the first report of the physical proximity of neurons and their targets prior to the migration of these neurons away from the developing target organ and eventual organ innervation. 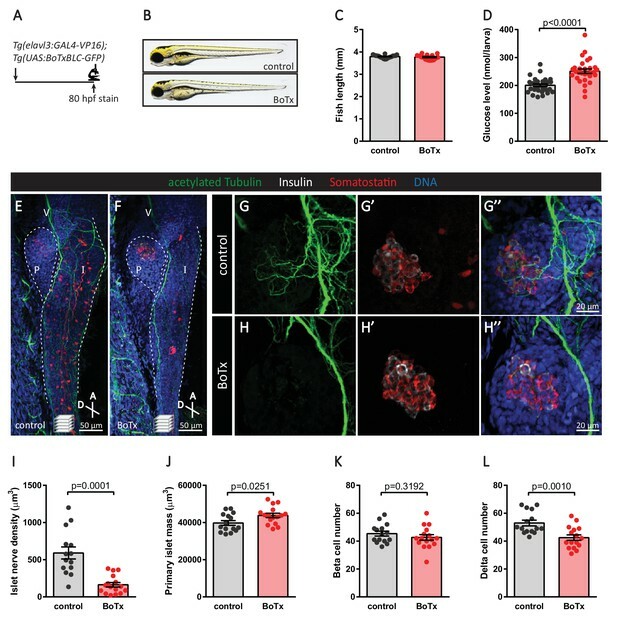 The power of in vivo time-lapse imaging and targeted cell ablation allowed us to characterize the cellular events leading to parasympathetic innervation of the endocrine pancreas in zebrafish. The uncovered sequence of events is reminiscent of the pioneer neuron model first proposed over a century ago and which has been observed in various model systems, including Drosophila (Sánchez-Soriano and Prokop, 2005; Lin et al., 1995; Jacobs and Goodman, 1989), zebrafish (Hoijman et al., 2017; Wanner and Prince, 2013), and mouse (Morante-Oria et al., 2003; Stainier and Gilbert, 1990). However, a key difference between what we observed and the classical model is that in the zebrafish pancreas these neurons are not migrating toward the target organ where they provide instructional cues for neuronal specification (Hoijman et al., 2017) or lay down axon tracks for the following neurons (Wanner and Prince, 2013). Instead, we observed the migration of these neurons away from the target organ while maintaining contact via neural extensions, which may subsequently provide tracks for other neurons to migrate along to reach their targets. Indeed, the diminished innervation density following their targeted ablation revealed the crucial role of these neurons that initially associate with the endocrine cells. Future studies designed to identify the guidance signals regulating the directional migration of these subpopulation of neurons and investigate the effect of the lack of pancreas innervation on islet cell development and regeneration should lead to further understanding of the innervation process and its importance in development and disease. In addition, it will be interesting to examine in detail the innervation of other organs to determine whether this model of early local neuronal differentiation followed by migration away from the target is a more general phenomenon. All zebrafish husbandry was performed under standard conditions in accordance with institutional (MPG) and national ethical and animal welfare guidelines. Adult zebrafish were fed a combination of fry food (Special Diet Services) and brine shrimp five times daily and maintained under a light cycle of 14 hr light: 10 hr dark at 28.5°C. Transgenic and mutant lines used were as described (Table 1): Tg(elavl3:GAL4-VP16)zf357 (Stevenson et al., 2012) (promoter activity in post-mitotic neurons), Tg(UAS:EGFP-CAAX)m1230 (Fernandes et al., 2012), Tg(sst2:RFP)gz19 (Li et al., 2009) (promoter activity in pancreatic delta cells), Tg(UAS:BoTxBLC-GFP)icm21 (Sternberg et al., 2016), cloches5 (Liao et al., 1997), clochem39 (Stainier et al., 1995), Tg(kdrl:EGFP)s843 (Jin et al., 2005) (promoter activity in endothelial cells), Tg(sox10:GAL4)sq9 (Lee et al., 2013) (promoter activity in neural crest cells), Tg(sox10:CreERT2, myl7:GFP)t007 (Mongera et al., 2013), Tg(ubb:loxP-CFP-loxP-nuc-mCherry)jh63 (Wang et al., 2015) (ubiquitous promoter activity), sox10tw2 (Kelsh et al., 1996), Tg(UAS:NTR-mCherry)c264 (Davison et al., 2007). Whole larva glucose levels were measured with Glucose Assay Kit (Millipore) from five larvae per replicate. List of zebrafish transgenic and mutant lines. Live zebrafish between 1 and 5 dpf were anesthetized with 0.017% Tricaine and mounted in 0.5% low melting agarose in egg water containing 0.017% Tricaine for confocal imaging. Zeiss LSM780 and LSM880 upright laser scanning confocal microscopes equipped with a Plan-Apochromat 20x/NA1.0 dipping lens were used for imaging. Time-lapse experiments were conducted in 28.5°C conditions and z-stacks were taken at 20–45 min intervals for overall timeframes of 15–20 hr. Images were analyzed using Imaris software (Bitplane). Embryos were anesthetized with 0.017% tricaine and mounted in 0.5% agarose. A Chameleon Vision II Ti:Sapphire Laser (Coherent) mounted on a Zeiss LSM880 microscope was used for two-photon single-cell laser ablations. The tunable laser was set at 800 nm to scan an ablation area of 4 µm2 at a scan speed of 1 with 10 iterations. Following ablation, embryos were removed from the agarose, raised to 80 hpf, and fixed with 4% paraformaldehyde for subsequent immunostaining. Zebrafish were euthanized with tricaine overdose prior to overnight fixation in 4% paraformaldehyde dissolved in PBS containing 120 µM CaCl2 and 4% sucrose, pH7.4. The skin was manually removed with forceps, without disturbing the internal organs and the zebrafish were permeabilized with 0.5% TritonX-100 for 3 hr at room temperature. Following blocking with 5% donkey serum (Jackson Immunoresearch) in blocking buffer (Dako), samples were incubated in primary antibodies overnight at 4°C, washed 4x with 0.025% TritonX-100 containing PBS, incubated in secondary antibodies overnight at 4°C, washed 4x, incubated in an increasing glycerol gradient of 25, 50, and 75%, and mounted in VectorShield mounting medium. The following antibodies and dilutions were used: guinea pig anti-Insulin polyclonal (1:100, Thermo), rabbit anti-Somatostatin (1:100, BioRad), chicken anti-GFP (1:200, Aves), mouse anti-acetylated Tubulin (1:200, Sigma), mouse monoclonal anti-HuC/D (1:100, Cell Signaling). Secondary antibodies (Jackson ImmunoResearch) used in this study include donkey anti-guinea pig AlexaFluor647 and 405, donkey anti-rabbit Cy3 and AlexaFluor488, donkey anti-mouse AlexaFluor488 and 647, donkey anti-chicken AlexaFluor488. Nuclei were stained with 25 µg/ml DAPI. Images were taken on Zeiss LSM700 or LSM800 laser scanning confocal microscopes equipped with a 25x/NA0.8 objective. Image data were analyzed using Imaris (Bitplane) and Huygens (Scientific Volume Imaging) softwares. Statistical analysis was performed using Prism (GraphPad). Stem Cells and Development 22:2145–2157. Trends in Cell Biology 16:105–112. The Journal of Clinical Endocrinology & Metabolism 92:4035–4038. The Journal of Neuroscience 9:2412–2422. The Journal of Comparative Neurology 508:756–770. Methods in Molecular Biology 546:133–143. Histochemistry and Cell Biology 145:105–117. Disease Models & Mechanisms 6:1080–1088. Islets have a lot of nerve! Or do they? Diabetes, Obesity and Metabolism 16:77–86. Trends in Molecular Medicine 13:405–413. Microscopy Research and Technique 37:399–406. Thank you for submitting your article "A new mode of organ innervation revealed by live imaging of the developing zebrafish pancreas" for consideration by eLife. Your article has been reviewed by three peer reviewers, and the evaluation has been overseen by a Reviewing Editor and K VijayRaghavan as the Senior Editor. The following individual involved in review of your submission has agreed to reveal his identity:: Mehboob Hussain (Reviewer #1). In general, there was a lot of enthusiasm for this interesting work which will enhance our understanding of pancreatic islet innervation, an area that is currently not well understood. However, despite their enthusiasm, there are a number of issues that the reviewers agree need to be resolved before this work can be considered for publication. Foremost among these is that your study does not reveal the origin of the Elav-expressing cells whose development you have described. Although you show that neural crest is required for pancreatic islet innervation, your study does not provide evidence that these Elav cells are neural crest derived, and thus does not rule out the possibility that they have an endocrine origin. Thus, you will need to investigate both whether neural crest cells and whether endocrine cells from the pancreas contribute to this Elav-expressing population. Sox10 may not be expressed early enough to be definitive for this experiment, thus you may need to use other transgenic lines to look at earlier developmental stages. This analysis will also provide important information on the timing of association of these cells with the developing pancreas. There are a number of other issues that should also be addressed in your resubmission. 1) We suggest changing the title to reflect the fact that you only investigate pancreatic islet innervation. 2) It would be useful to distinguish neurites derived from the vagus nerve from those of the Elav-expressing cells. 3) It is difficult to see the detachment of the Elav-expressing cells in your movies, making it unclear whether the later cells arise from proliferation or cells that turn on Elav expression at a later time. 4) The laser-directed, ntr-directed, and botulinic toxin-directed ablations have different outcomes on δ cells and β cells. It would be useful to clarify this more in the text and to document the δ cell hypertrophy in the supplemental data. We thank the reviewers for this comment and have now employed two different methods to address the origin of the cells displaying elavl3 promoteractivity. First lineage tracing with Tg(sox10:CreERT2, myl7:GFP); Tg(ubb:loxP-CFP-loxP-nuc-mCherry) zebrafish upon tamoxifen treatment from 16 to 24 hpf in combination with the elavl3 reporter line was used to show that the elavl3+ migratory population of cells were once positive for sox10 promoter activity (as seen in new Figure 3B and updated Figure 4). Additional lineage tracing experiments also indicated that neural crest derived cells were not positive for Insulin, Glucagon, or Somatostatin immunostaining (Figure 4B). Second, we conducted time-lapse imaging of Tg(sox10:GAL4); Tg(UAS:GFP); Tg(sst2:RFP) zebrafish and observed a similar subset of cells migrating away from the islet (Figure 3C). These cells were not positive for Insulin or Somatostatin. These results are now included in the new Figure 3. Although the elavl3 promoter is active in a subpopulation of endocrine cells in early stages of development (Figure 2B), our data suggest that they do not contribute to the subset of cells migrating away from the islet. We have changed the title to “A new mode of pancreatic islet innervation revealed by live imaging in zebrafish”. We thank the reviewers for this comment and agree that it would be useful to distinguish vagus nerve neurites from those of the detached elavl3 expressing cells. We have attempted to conduct lineage tracing with photoconversion of Tg(elavl3:GAL4-VP16); Tg(UAS:Dendra); Tg(sst2:RFP), but have not been able to observe any photo-converted cells at the 80 hpf timepoint, likely due to the degradation of the photo-converted protein over time. Without an inducible CreER transgenic line that could be used to selectively mark this sub-cluster of neurons, we are currently unable to lineage trace with permanent expression of a reporter. We hope that the reviewers understand the technical difficulties related to this experiment. We have however now stained Tg(elavl3:GAL4-VP16); Tg(UAS:EGFP-CAAX); Tg(sst2:RFP) zebrafish with acetylated tubulin (Figure 2—figure supplement 1). Although this approach is not sufficient to quantify nerve density arising from the vagus versus the elavl3 expressing detached neurons, it reveals that at least a subset of nerves are extending from neurons that appear to have detached from the islet. We have included a statement in the manuscript addressing this concern that without lineage tracing, it is hard to distinguish the nerves from the detached neurons versus those from the vagus. We have now adjusted the contrast to help the visualization of these cells. We have now discussed the differences in the outcomes of the various models. The quantification of δ cell hypertrophy in the Tg(elavl3:GAL4-VP16); Tg(UAS:BoTxBLC-GFP) model is now included in Figure 7—figure supplement 1. These studies were supported by funds from the Max Planck Society to DYRS. KK was supported by a NBRP grant from AMED. YHCY was supported by a CIHR Postdoctoral Fellowship, an EMBO Long-Term Fellowship, an HFSP Long-Term Fellowship, and a NIG-JOINT funding. The referenced transgenic lines were generously provided by Zhiyuan Gong, Wolfgang Driever, Michael Parsons, and Christiane Nüsslein-Volhard. We thank Radhan Ramadass for imaging advice. Animal experimentation: All zebrafish husbandry was performed under standard conditions in accordance with institutional (MPG) and national ethical and animal welfare guidelines approved by the ethics committee for animal experiments at the Regierungspräsidium Darmstadt, Germany (permit numbers B2/1138 and B2/Anz. 1007). © 2018, Yang et al.